Time to try making profiteroles again and this time the result was really good – recipe from here (I love this book). Next time I’ll add a tiny splash of vanilla to disguise the light eggy smell. Preheat the oven to 180°C/350°F*; line two large baking sheets with baking paper. Place the water and butter in a medium saucepan over high heat and bring to the boil. Add the flour and beat with a wooden spoon until smooth. Cook, stirring, over low heat until the mixture leaves the sides of the pan. Remove from the heat, place in an electric mixer and beat on high, gradually adding the eggs until well combined. Spoon the mixture into a piping bag with a 12mm plain nozzle and pipe 4cm rounds onto prepared sheets, 5cm (2in) apart. Bake for 25-30 minutes or until puffed and dark golden. Cool on wire racks, then carefully peel the profiteroles off the paper. Using the tip of a sharp knife, make a small hole in the bottom of each puff. Place the dulce de leche in a piping bag fitted with a small nozzle - I used a ¼ inch one . Insert nozzle into hole of each choux puff and pipe in enough dulce de leche to fill. Set aside. 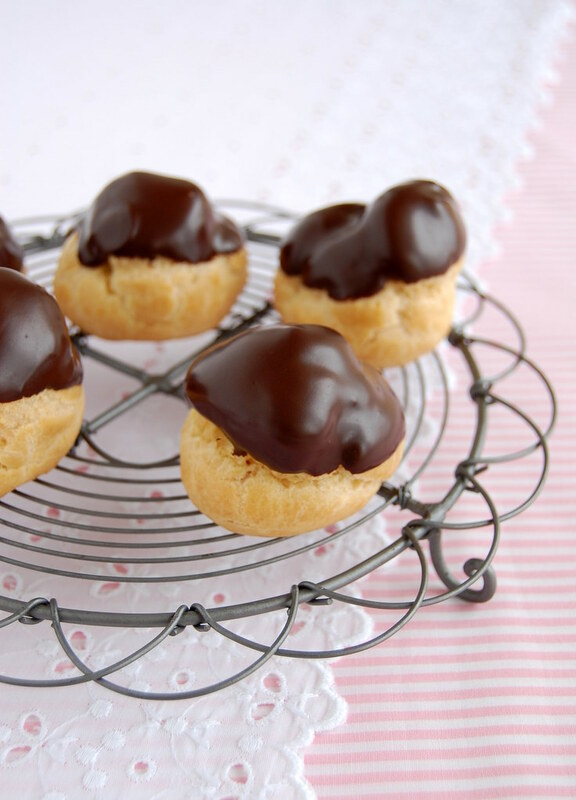 Carefully dip the top of each profiterole in the melted chocolate and set aside until firm. I`ve never heard about dulce de leche profiteroles! these are so tiny and so quite! Ooohhh.. now I know another use for DDL. Cute! Profiteroles are so lovely and so is dulce de leche. I used to think twitter was weird and lame; of course I changed my mind! My sister tried to make croquembouche once - the spun sugar did NOT turn out well. Yours look simply scrumptious! I really like how you photographed them. May I inquire where you bought your cooking rack? It's adorable. I just bought that book and have only enjoyed it for the fantastic pics (nothing less from DH) so far. These look delicious and were always one of my favorite bakery treats growing up. Welcome to Twitter -it just got better with your being there! And these....oh my! Dulce de leche macarons...LOVE! These look delicious. I made a batch last weekend as well and do agree that baking at 200C works best. These look fabulous! I've never thought about filling the cream puffs with dulce de leche. Now I have a good way to use the jar I put up a few weeks ago. Wow. I've been wanting to make profiteroles for a while now and I think this has given me a reason! What a great idea. I just made some the other day with just the chocolate sauce. I'm going to have to try this recipe. Spun sugar is complicated, isn't it? The rack was a gift from a lovely friend of mine, she bought it in London. Xiaolu, that book has so many wonderful recipes and they all work beautifully, I know you'll enjoy it! Of course I don't mind you asking: the rack was a gift from a lovely friend of mine, she bought it in London. Helen, you are just too sweet! Thank you for the warm welcome, my dear! Jo, thank you! I thought so, too - they turned out perfect at 200°C. Fran, thank you! It is a very common filling for them here in Brazil. I'm glad you like it! I think I've made up my mind about the size - will publish something about it next week. Michele, thank you for visiting! Hope you like the DDL version. What perfect profiteroles! And I love that they're filled with dulce de leche instead of custard or whipped cream. Hey, Anonymous, thank you for stopping by! Hope you give these a go! DDL as a filling for profiteroles is super common here in Brazil. I love that these have a dulce de leche filling! It really takes them to a whole new level. Great job with the pastries. I love profiteroles; anytime, anywhere. 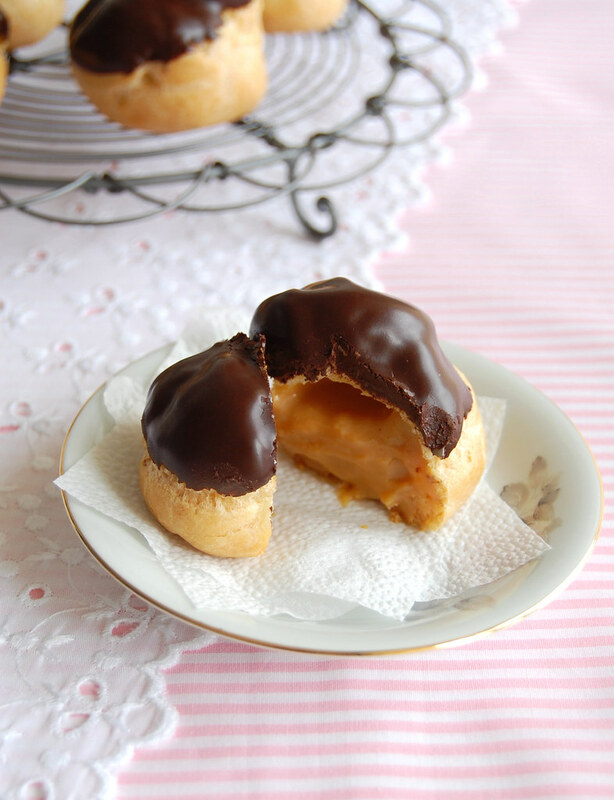 It is one of my favorite desserts and your combo of dulce de leche, choux paste and chocolate = yum, yum, yum!!!! I wish we were neighbors! In Uruguay we love dulce de leche and a lot of pastries are made with it, so when I go to buy them it is important to tell that they do not put all of dulce de leche!!! if you want dulce de leche recipes I have a lot for instance dulce de flan delicious, love your recipes. Susan, I love anything dulce de leche - thank you! I would love to have you around, sweetie! Estresu, thank you for stopping by! Dulce de leche is very popular here in Brazil, too!